A march in Chicago, called at a few days’ notice, brought out about 3,000 people, mainly women, on Sunday, February 18. Calls from the platform against NRA-supported politicians, to “Vote them out” were replaced on the street by “Throw them out.” This is indicative of a mood in society that does not want to wait for the November elections. The lead is being given by youth. Students in high school today were 10, 11, or 12 when Sandy Hook happened in December 2012. They have grown up with active shooter drills and those drills, tragically, didn’t save them. 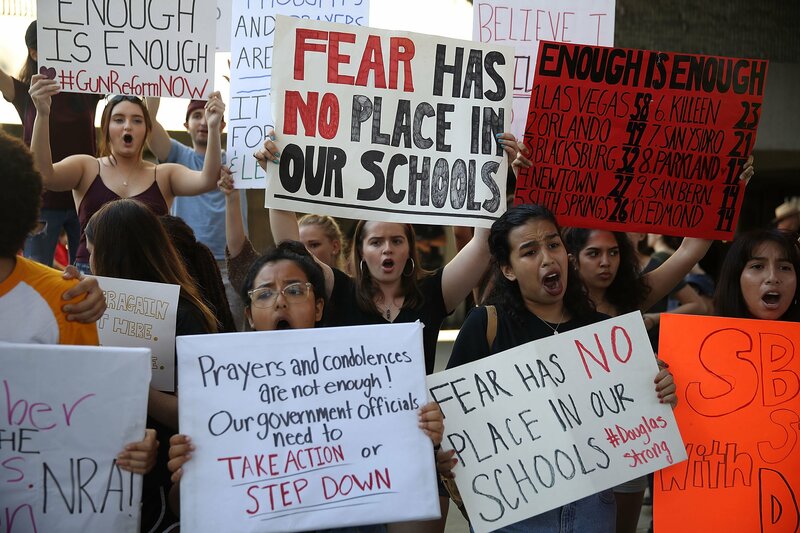 Further protests are planned – on Wednesday, February 21, students in Broward County schools are holding a lunchtime protest; on March 14 the national Women’s March organization has called for a coordinated walkout of students and teachers in schools across the nation. Plans are also being laid for a national day of action on April 20 which is the anniversary of the Columbine school shooting as well as for a march in Washington DC on March 24. Unions that represent teachers and other school employees should support these calls and mobilize their members to take action alongside students, including strike action where possible. The mobilizations should escalate around concrete demands including banning military-style semi-automatic weapons and other basic gun safety measures; full funding for all school services to help students in crisis situations and demilitarization of our communities. School shootings are the most horrific aspect of the epidemic levels of gun violence in the United States which is far higher than in any other wealthy society. There are many reasons for the scale of violence but all point back to the savage history of American capitalism and the brutal alienation and inequality it engenders today. The past 40 years of neo-liberal policies have seen relentless attacks on the historic gains of working people, women, and black people. These attacks have been carried out under both Republican and Democratic administrations. With the profound weakening of the labor movement and the massive increase in inequality, there has been a loss of the traditions of collective action and solidarity which are vital to pushing back the dark forces tearing at our social fabric. Build, spread and escalate the movement including mass walkouts, protests, occupations and strike action. We stand for the existing ban on fully automatic weapons under the National Firearms Act of 1934, to be extended to semi-automatic military style weapons such as the AR-15 which were used at Columbine, Sandy Hook, San Bernadino, Las Vegas, Parkland and many other mass shootings. (These weapons were banned in 1994 but only for ten years after which Congress allowed the ban to lapse). For the restoration of the ban on large capacity magazines and other modifications that enhance performance. A background check and waiting period for all gun sales, closing the gun show loophole; however background check denials need to be for good cause (for example a history of domestic violence) and subject to democratic accountability and appeal. Banning anyone with a conviction from buying a gun in practice means excluding a significant section of the black working class. At the very least, there should be an appeal process built into background checks. The demilitarization of the police and public schools. Schools should have democratically elected committees to ensure the safety and wellbeing of all employees, students and parents. These committees should have a controlling oversight over all measures pertaining to health and safety, including fully funded, wrap around social work and counseling services and the power to decide what physical measures are needed to protect both students and staff. Get the NRA and ROTC out of our schools; Nikolas Cruz was trained to shoot in a program funded with a $10,000 grant from the NRA. The NRA is a lobbying organization for the gun industry and cannot be trusted with “gun safety” programs. As with the ROTC, these programs are used to advocate for a false set of ideas (for example the ROTC trains kids to believe that “America never lost a war”) that should not be part of public education. Programs that teach gun safety or marksmanship need to be under the democratic control of elected public school boards or other forms of community or trade union control. Full funding for social service programs in schools including trained counselors and school psychologists. Like art, music and libraries, these are not a luxury, they are part of an education system that focuses on the needs of human beings. A massive jobs program, a $15 an hour federal minimum wage and other anti-poverty measures, and a single-payer, socialized health-care system which prioritizes mental health care would be huge steps forward in creating a saner, less violent society. We advocate all measures that would reduce the level of inequality in society and that would dismantle institutional racism, but we stress that only by uprooting capitalism can we create a just, egalitarian society. Next articleSeattle School Bus Drivers Strike and Win!